Destruction is inevitable, resistance is futile. After the first Matrix movie, I stopped listening to the screenplay, it was so full of fantasy physics and beyond making sense. I do remember the part about living in a false consciousness generously padded with the fat marbled layers of a material world. We eventually awaken to discover we are naked and afraid, living inside our own eggs precariously attached to a cold wet outcropping at the edge of the howling wind and crying ocean. It is much cozier to gaze at the raindrops pelting the window pane, forget we are engaged in our own undoing. It’s nice in this chair, but it doesn’t stop the polar ice caps from melting. Hiroshima was an awful mistake, still praying for peace, but we can’t look in the mirror anymore. Just get rid of the bombs. You first, no you first, forget it. Nobody is flying the plane. Mixed Media, 24 X 18. 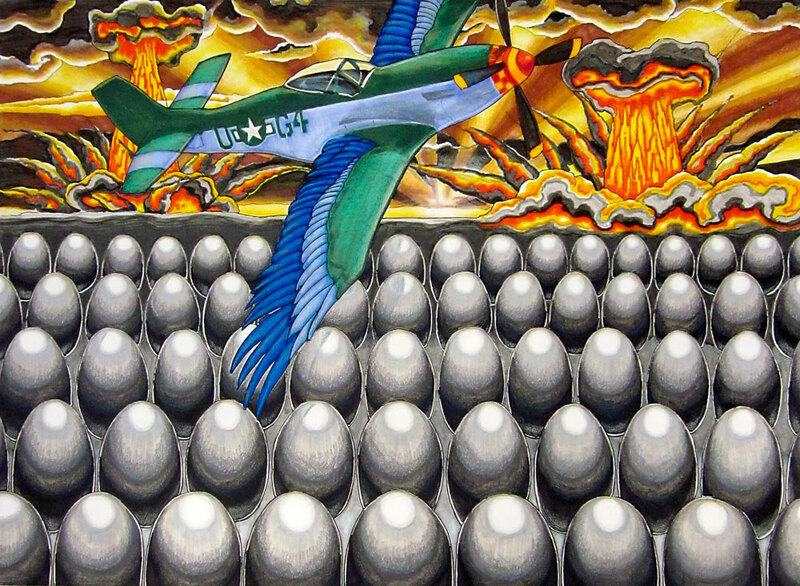 This entry was posted in Art, drawings and tagged apocalypse, Art, drawings, eggs, Hiroshima, planes, the Matrix by selina. Bookmark the permalink.